Just after midnight of June 6, 1968, Senator Robert Kennedy was assassinated in a backroom of the Ambassador Hotel in Los Angeles. He had just been celebrating his victory at the California primaries, which made him the most likely Democratic nominee for the presidential election. His popularity was so great that Richard Nixon, on the Republican side, stood little chance. At the age of 43, Robert would have become the youngest American president ever, after being the youngest Attorney General in his brother’s government. His death opened the way for Nixon, who could finally become president eight years after having been defeated by John F. Kennedy in 1960. John had been assassinated four and a half years before Robert. Had he survived, he would certainly have been president until 1968. Instead, his vice-president Lyndon Johnson took over the White House in 1963, and became so unpopular that he retired in 1968. Interestingly, Johnson became president the very day of John’s death, and ended his term a few months after Robert’s death. He was in power at the time of both investigations. And both investigations are widely regarded as cover-ups. In both cases, the official conclusion is rife with contradictions. We are going to sum them up here. But we will do more: we will show that the key to solving both cases resides in the link between them. And we will solve them beyond a reasonable doubt. John and Robert were bound by an unshakable loyalty. Kennedy biographers have stressed the absolute dedication of Robert to his elder brother. Robert had successfully managed John’s campaign for the Senate in 1952, then his presidential campaign in 1960. John made him not only his Attorney General, but also his most trusted adviser, even on matters of Foreign or Military affairs. What John appreciated most in Robert was his sense of justice and the rectitude of his moral judgment. It is Robert, for example, who encouraged John to fully endorse the cause of the Blacks’ civil rights movement. Given this exceptional bond between the Kennedy brothers, what is the probability that the two Kennedy assassinations were unrelated? Rather, we should start with the assumption that they are related. Basic common sense suggests that the Kennedy brothers have been killed by the same force, and for the same motives. It is, at least, a logical working hypothesis that Robert was eliminated from the presidential race because he had to be prevented from reaching a position where he could reopen the case of his brother’s death. Both his loyalty to his brother’s memory, and his obsession with justice, made it predictable that, if he reached the White House, he would do just that. But was there, in 1968, any clear indication that he would? Did Bobby plan to reopen the investigation on his brother’s assassination? From 22 November 1963, Robert was alienated and monitored by Johnson and Hoover. Although still Attorney General, he knew he was powerless against the forces that had killed his brother. Yet he lost no time beginning his own investigation; he first asked CIA director John McCone, a Kennedy friend, to find out if the Agency had anything to do with the plot, and came out convinced that it hadn’t. In March 1964, he had a face-to-face conversation with mobster Jimmy Hoffa, his sworn enemy, whom he had battled for ten years, and whom he suspected of having taken revenge on his brother. Robert also asked his friend Daniel Moynihan to search for any complicity in the Secret Service, responsible for the President’s security. And of course, Robert suspected Johnson, whom he had always mistrusted, as Jeff Shesol documents in Mutual Contempt: Lyndon Johnson, Robert Kennedy, and the Feud that Defined a Decade (1997). Robert had planned to run for the American Presidency in 1972, but the escalation of the Vietnam War precipitated his decision to run in 1968. Another factor may have been the opening of the investigation by New Orleans District Attorney Jim Garrison in 1967. Garrison was allowed to view Abraham Zapruder’s amateur film, confiscated by the FBI on the day of the assassination. This film, despite evident tampering, shows that the fatal shot came from the “grassy knoll” well in front of the President, not from the School Book Depository located behind him, where Oswald was supposed to be shooting from. When talk of the investigation began, Kennedy asked one of his closest advisors, Frank Mankievitch, to follow its developments, “so if it gets to a point where I can do something about this, you can tell me what I need to know.” He confided to his friend William Attwood, then editor of Look magazine, that he, like Garrison, suspected a conspiracy, “but I can’t do anything until we get control of the White House.”  He refrained from openly supporting Garrison, believing that since the outcome of the investigation was uncertain, it could jeopardize his plans to reopen the case later, and even weaken his chances of election by construing his motivation as a family feud. In conclusion, there can be little doubt that, had he been elected president, Robert Kennedy would have done everything possible to reopen the case of his brother’s assassination, in one way or another. This fact certainly did not escape John’s murderers. They had no other option but to stop him. This first conclusion is a sufficient reason to conduct a comparative analysis of both Kennedy assassinations, in search of some converging clues that might lead us to the trail of a common mastermind.We begin with Robert’s assassination. Sirhan Sirhan, a Palestinian motivated by hatred of Israel? Just hours after Robert’s assassination, the press was able to inform the American people, not only of the identity of the assassin, but also of his motive, and even of his detailed biography. Twenty-four-year-old Sirhan Bishara Sirhan was born in Jordania, and had moved to the United States when his family was expelled from West Jerusalem in 1948. After the shooting, a newspaper clipping was found in Sirhan’s pocket, quoting favorable comments made by Robert regarding Israel and, in particular, what sounded like an electoral commitment: “The United States should without delay sell Israel the 50 Phantom jets she has so long been promised.” Handwritten notes by Sirhan found in a notebook at his home confirmed that his act had been premeditated and motivated by his hatred of Israel. After September 11, 2001, the tragedy of Robert’s assassination was installed into the Neocon mythology of the Clash of Civilizations and the War on Terror the story. Sirhan became a precursor of Islamic terrorism on the American soil. In a book entitled The Forgotten Terrorist, Mel Ayton, who specializes in debunking conspiracy theories, claims to present “a wealth of evidence about [Sirhan’s] fanatical Palestinian nationalism,” and to demonstrate that “Sirhan was the lone assassin whose politically motivated act was a forerunner of present-day terrorism” (as written on the back cover). This leitmotiv of the public discourse begs the question: Was Bobby really a supporter of Israel? But before we answer that question, there is on more pressing one: Did Sirhan really kill Bobby? Did Sirhan Bishara Sirhan really kill Robert Kennedy? If we trust official statements and mainstream news, the assassination of Robert Kennedy is an open-and-shut case. The identity of the killer suffers no discussion, since he was arrested on the spot, with the smoking gun in his hand. In reality, ballistic and forensic evidence show that none of Sirhan’s bullets hit Kennedy. According to the autopsy report of Chief Medical Examiner-Coroner Thomas Noguchi, Robert Kennedy died of a gunshot wound to the brain, fired from behind the right ear at point blank range, following an upward angle. Nogushi restated his conclusion in his 1983 memoirs, Coroner. Yet the sworn testimony of twelve shooting witnesses established that Robert had never turned his back on Sirhan and that Sirhan was five to six feet away from his target when he fired. Tallying all the bullet impacts in the pantry, and those that wounded five people around Kennedy, it has been estimated that at least twelve bullets were fired, while Sirhan’s gun carried only eight. On April 23, 2011, attorneys William Pepper and his associate, Laurie Dusek, gathered all this evidence and more in a 58-page file submitted to the Court of California, asking that Sirhan’s case be reopened. They documented major irregularities in the 1968 trial, including the fact that the bullet tested in laboratory to be compared to the the one extracted from Robert’s brain had not been shot by Sirhan’s revolver, but by another gun, with a different serial number; thus, instead of incriminating Sirhan, the ballistic test in fact proved him innocent. Pepper has also provided a computer analysis of audio recordings during the shooting, made by engineer Philip Van Praag in 2008, which confirms that two guns are heard. He also claims to have no memory of “many things and incidents which took place in the weeks leading up to the shooting.”  Some repetitive lines written of a notebook found in Sirhan’s bedroom, which Sirhan recognizes as his own handwriting but does not remember writing, are reminiscent of automatic writing. We know that in the 1960s, American military agencies were experimenting on mental control. Dr Sidney Gottlieb, son of Hungarian Jews, directed the infamous CIA MKUltra project, which, among other things, were to answer questions such as: “Can a person under hypnosis be forced to commit murder?” according to a declassified document dated May 1951. According to Israeli journalist Ronen Bergman, author of Rise and Kill First: The Secret History of Israel’s Targeted Assassinations (Random House, 2018), in 1968, an Israeli military psychologist by the name of Benjamin Shalit had concocted a plan to take a Palestinian prisoner and “brainwash and hypnotize him into becoming a programmed killer” aimed at Yasser Arafat. If Sirhan was hypnotically programmed, the question is: Who had some interest in having a visceral anti-Zionist Palestinian blamed for the killing of Robert Kennedy? Israel, of course. But then, we are faced with a dilemma, for why would Israel want to kill Robert Kennedy if Robert Kennedy was supportive of Israel, as the mainstream narrative goes? Was Robert Kennedy really a friend of Israel? All things considered, there is no ground for believing that Robert Kennedy would have been, as president of the US, particularly Israel-friendly. The Kennedy family, proudly Irish and Catholic, was known for its hostility to Jewish influence in politics, a classic theme of anti-Kennedy literature, best represented by the 1996 book by Ronald Kessler with the highly suggestive title, The Sins of the Father: Joseph P. Kennedy and the Dynasty He Founded. Robert had not been, in his brother’s government, a particularly pro-Israel Attorney General: He had infuriated Zionist leaders by supporting an investigation led by Senator William Fulbright of the Senate Committee on Foreign Relations aimed at registering the American Zionist Council as a “foreign agent” subject to the obligations defined by the Foreign Agents Registration Act of 1938, which would had considerably hindered its efficiency (after 1963, the AZD escaped this procedure by changing its status and renaming itself AIPAC). Robert Kennedy’s death had not been a bad thing for the precious “American-Israeli relationship.” Rather, it was a great loss for the Arab world, where Bobby was mourned just as had his brother John before him. Of course, the fact that the Zionist media lied when granting Robert Kennedy some posthumous certificate of good will toward Israel, and thereby provided Israel with a fake alibi, is not a sufficient reason for concluding that Israel murdered Robert. Even the fact that the masterminds of the plot chose as their programmed instrument an anti-Zionist Palestinian, and thereby stirred a strong anti-Palestinian feeling among Americans at the same time as getting rid of Robert, does not prove that Israel was involved. What is still lacking for a serious presumption is a plausible motive. The motive of Robert’s assassination must be found, not in what Robert publicly declared in an Oregon synagogue during his presidential campaign, but rather in what he confided only to his most close friends: his intention to reopen the investigation on his brother’s death. Our next question, therefore, is: What would an unbiased investigation, conducted under the supervision of Robert in the White House, have revealed? Did the CIA assassinate Kennedy? It is obvious to anybody just vaguely informed that a genuine investigation would first establish that Oswald was a mere “patsy”, as he said himself, a scapegoat prepared in advance to be blamed for the crime and then be slaughtered without a trial. We will not here review the evidence that contradicts the official thesis of the lone gunman. It can be found in numerous books and documentary films. Just as notorious is the theory that the plot to kill Kennedy originated from a secret network within the CIA, in collusion with extremist elements in the Pentagon. That conspiracy theory looms the largest in books, articles and films that have been produced since John Kennedy died. That CIA-Pentagon theory, as I will call it (add the military-industrial complex if you wish) has a major flaw in the motive ascribed to the killers: besides getting rid of Kennedy, the theory goes, the aim was to create a pretext for invading Cuba, something the CIA had always pushed for and Kennedy had refused to do (the Bay of Pigs fiasco). With Oswald groomed as a pro-Castro communist, the Dallas shooting was staged as a false flag attack to be blamed on Cuba. But then, why did no invasion of Cuba follow Kennedy’s assassination? Why was the pro-Castro Oswald abandoned by the Warren Commission in favor of the lone nut Oswald? Those who address the question, like James Douglass in his JFK and the Unspeakable, credit Johnson with preventing the invasion. Johnson, we are led to understand, had nothing to do with the assassination plot, and thwarted the plotters’ ultimate aim to start World War III. This is to ignore the tremendous amount of evidence accumulated against Johnson for fifty years, and documented in such groundbreaking books as Phillip Nelson’s LBJ: The Mastermind of JFK’s Assassination (2010) or Roger Stone’s The Man Who Killed Kennedy: The Case Against LBJ (2013). But there is plenty of evidence that Angleton, who was also the head of the CIA “Israel Office,” was a Mossad mole. According to his biographer Tom Mangold, “Angleton’s closest professional friends overseas […] came from the Mossad and […] he was held in immense esteem by his Israeli colleagues and by the state of Israel, which was to award him profound honors after his death.”  No less that two monuments were dedicated to him at memorial services in Israel during ceremonies attended by chiefs of Israeli Intelligence and even a future Prime Minister. One month after Kennedy’s assassination, it was the turn of the Washington Post to use a very similar trick, by publishing an op-ed signed by Harry Truman, in which the former president said he was “disturbed by the way CIA has been diverted from its original assignment.” “I never had any thought when I set up the CIA that it would be injected into peacetime cloak and dagger operations,” at the point of becoming across the globe “a symbol of sinister and mysterious foreign intrigue […] there are now some searching questions that need to be answered.”  Truman was hinting at the CIA’s role in toppling foreign governments and assassinating elected leaders abroad. But given the timing of his article, one month to the day after Dallas, it could only be understood by anyone with ears to hear, and at least subliminally by the rest, as an indictment of the CIA in the Kennedy assassination. This article, widely reprinted in the 1970s after the creation of the Church Committee and the House Select Committee on Assassinations, is regarded as Truman’s whistleblowing. Yet its mea culpa style is quite unlike Truman; that is because it was not written by Truman, but by his longtime assistant and ghostwriter, a Russian born Jew named David Noyes, whom Sidney Krasnoff calls “Truman’s alter ego” in his book, Truman and Noyes: Story of a President’s Alter Ego (1997). Truman probably never saw the article prior to its publication in the Washington Post morning edition, but he may be responsible for its deletion from the afternoon print runs. So the two most influential American newspapers, while ostensibly defending the official theory of the lone gunman, have planted directional signs pointing to the CIA. Most Kennedy truthers have followed the signs with enthusiasm. In the 70s, the mainstream media and publishing industry played again a major role in steering conspiracy theorists toward the CIA, while avoiding any hint of Israeli involvement. One major contributor to that effort was A. J. Weberman, with his 1975 book Coup d’État in America: The CIA and the Assassination of John F. Kennedy, co-authored by Michael Canfield. According to the New York Jewish Daily Forward (December 28, 2012), Weberman had “immigrated to Israel in 1959 and has dual American-Israeli citizenship,” and is “a close associate of Jewish Defense Organization founder Mordechai Levy, whose fringe group is a spin-off of the late Rabbi Meir Kahane’s militant right-wing Jewish Defense League.” Weberman acknowledged Neocon Richard Perle’s assistance in his investigation. The Weberman-Canfield book contributed to the momentum that led the House Select Committee on Assassinations (HSCA) to reinvestigate in 1976 the murders of JFK and Dr. Martin Luther King. 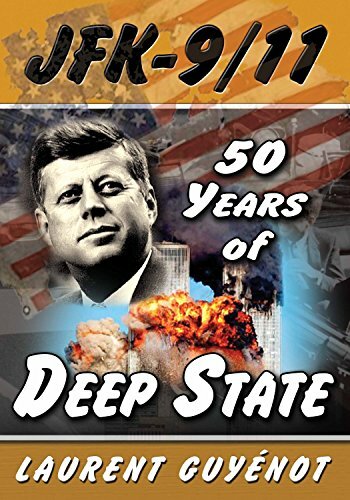 It is also in this context that Newsweek journalist Edward Jay Epstein published an interview of George De Mohrenschildt, a Russian geologist and consultant for Texan oilmen who had befriended Oswald and his Russian wife in Dallas in 1962. In this interview, De Mohrenschildt admitted that Oswald had been introduced to him at the instigation of Dallas CIA agent J. Walton Moore. That piece of information is dubious for several reasons: First, Moore was officially FBI rather than CIA. Second, De Mohrenschildt was in no position to confirm or deny the words that Epstein ascribed to him: he was found dead a few hours after giving the interview. In fact, De Mohrenschildt’s interview published by Epstein contradicts De Mohrenschildt’s own manuscript account of his relationship to Oswald, revealed after his death. De Mohrenschildt’s death was ruled a suicide. The Sheriff’s report mentions that in his last months he complained that “the Jews” and “the Jewish mafia” were out to get him. Needless to say, Epstein didn’t mention anything about this. More suspicions arise from the fact that Epstein’s main source for his 1978 book, Legend: the Secret World of Lee Harvey Oswald, was James Jesus Angleton, who was actively spreading disinformation at the time of the HSCA, defending the theory that Oswald was a KGB agent with CIA connections. That Israeli agents have been instrumental in spreading conspiracy theories targeting the CIA is also evidenced by Oliver Stone’s film JFK released in 1991, starring Kevin Costner in the role of New Orleans District Attorney Jim Garrison. This film, which shook public opinion to the point of motivating the President John F. Kennedy Assassination Records Collection Act of 1992, was produced by Arnon Milchan, described in a 2011 biography as being from his youth “one of the most important covert agents that Israeli intelligence has ever fielded,” involved in arms smuggling from the US to Israel. In 2013 Milchan publicly revealed his extended activity as a secret agent of Israel, working in particular to boost Israel’s nuclear program. It is therefore no wonder that Stone’s film gives no hint of the Mossad connection that Garrison stumbled upon. By a strange paradox, the authors who stand for the consensual conspiracy theory of a CIA plot against Kennedy build their case on the biography of Oswald, while at the same time claiming that Oswald had almost nothing to do with the killing. If Oswald was “just a patsy,” as he publicly claimed, the quest for the real culprits must logically begin by investigating the man who silenced Oswald. Oswald’s assassin is known as Jack Ruby, but few people know that his real name was Jacob Leon Rubenstein, and that he was the son of Jewish Polish immigrants. Ruby was a member of the Jewish underworld. He was a friend of Los Angeles gangster Mickey Cohen, whom he had known and admired since 1946. Cohen was the successor of the famed Benjamin Siegelbaum, aka Bugsy Siegel, one of the bosses of Murder Incorporated. Cohen was infatuated with the Zionist cause, as he explained in his memoirs: “Now I got so engrossed with Israel that I actually pushed aside a lot of my activities and done nothing but what was involved with this Irgun war”. Mickey Cohen was in contact with Menachem Begin, the former Irgun chief, with whom he even “spent a lot of time,” according to Gary Wean, former detective sergeant for the Los Angeles Police Department. So there is a direct line connecting Jack Ruby, via Mickey Cohen, to the Israeli terrorist ring, and in particular to Menachem Begin, a specialist in false flag terror. We also know that Ruby phoned Al Gruber, a Mickey Cohen associate, just after Oswald’s arrest; no doubt he received then “an offer he couldn’t refuse,” as they say in the underworld. Ruby’s defense lawyer William Kunstler wrote in his memoirs that Ruby told him he had killed Oswald “for the Jews,” and Ruby’s rabbi Hillel Silverman received the same confession when visiting Ruby in jail. That is not all. At every level of the conspiracy to kill Kennedy, we also find the fingerprints of the Israeli deep state. JFK’s trip to Dallas, being officially “non political,” was sponsored by a powerful business group known as the Dallas Citizens Council, dominated by Julius Schepps, “a wholesale liquor distributor, member of every synagogue in town, and de facto leader of the Jewish community,” as described by Bryan Edward Stone in The Chosen Folks: Jews on the Frontiers of Texas. Kennedy was on his way to the reception organized in his honor when he was shot. So, at all stages of the plot, we find a Zionist cabal including business men, politicians and Irgun-connected gangsters, not forgetting media executives, all devoted to Israel. The most plausible motive for Israel to kill Kennedy has been revealed by two books: Seymour Hersh’s The Samson Option in 1991, then Avner Cohen’s Israel and the Bomb in 1998, and the lead has been followed up in 2007 by Michael Karpin in The Bomb in the Basement. What these investigators reveal is that Kennedy, informed by the CIA in 1960 of the military aim pursued at the Dimona complex in the Negev desert, was firmly determined to force Israel to renounce it. With that purpose in mind, he replaced CIA Director Allen Dulles by John McCone, who had, as Eisenhower’s chairman of the Atomic Energy Commission (AEC), leaked to The New York Times the truth about Israel’s Dimona project; the story was printed on December 19, 1960, weeks before Kennedy was to take office. As Alan Hart writes, “there can be no doubt that Kennedy’s determination to stop Israel developing its own nuclear bomb was the prime factor in his decision to appoint McCone.” Then Kennedy urged Ben-Gurion to allow regular inspections of Dimona, first verbally in New York in 1961, and later through more and more insistent letters. In the last one, cabled June 15, 1963 to the Israeli ambassador with instruction to hand it personally to Ben-Gurion, Kennedy demanded Ben-Gurion’s agreement for an immediate visit followed by regular visits every six months, otherwise “this Government’s commitment to and support of Israel could be seriously jeopardized.”  The result was unexpected: Ben-Gurion avoided official reception of the letter by announcing his resignation on June 16. As soon as the new Prime Minister Levi Eshkol took office, Kennedy sent him a similar letter, dated July 5, 1963, to no avail. Did Ben-Gurion resign in order to deal with Kennedy from another level? After Kennedy’s death, American foreign policy was reversed again, without the American public being aware of it. Johnson cut the economic aid to Egypt, and increased the military aid to Israel, which reached 92 million dollars in 1966, more than the total of all previous years combined. For 50 years, the Israeli trail in the Kennedy assassination has been smothered, and anyone who mentioned it was immediately ostracized. American congressman Paul Findley nevertheless dared write in March 1992 in the Washington Report on Middle East Affairs: “It is interesting to note that in all the words written and uttered about the Kennedy assassination, Israel’s intelligence agency, the Mossad, has never been mentioned.” One single author has seriously investigated that trail: Michael Collins Piper, in his 1995 book Final Judgment: The Missing Link in the JFK Assassination Conspiracy. Piper was largely ignored by the mainstream of the Kennedy truth movement. But his work has made its way nevertheless. In 2013, Martin Sandler wrote about Piper’s work in his edition of letters by Kennedy, which included those addressed to Ben-Gurion about Dimona: “Of all the conspiracy theories, it remains one of the most intriguing.” It is, in fact, a theory widespread in Arab countries. Several investigators have identified Lyndon Johnson, Kennedy’s vice-president, as the mastermind of the Kennedy assassination. It is, at least, beyond doubt that the plotters acted with the foreknowledge that Johnson, who automatically stepped in as head of State after Kennedy’s death, would cover them. The context of national crisis enabled him to bully both Justice and the press while achieving his life’s ambition. Johnson not only benefitted from the plot; he participated in its elaboration. As a former senator from Texas, he could mobilize high-ranked accomplices in Dallas to prepare the ambush. Johnson also had his men in the Navy. In 1961, Texan senator John Connally had been appointed as Navy Secretary at the request of Johnson. When Connally resigned eleven months later to run for governor of Texas, Johnson convinced Kennedy to name another of his Texan friends, Fred Korth. Johnson’s privileged control over the Navy is an important aspect of the case because the Navy was critical in the setting up and in the cover-up of the plot. First, contrary to a widespread but erroneous belief, Lee Harvey Oswald had been recruited by the Navy and not by the CIA. He was a Marine, and as a Marine he had worked for the Office of Naval Intelligence (ONI). Secondly, it is at the Naval Hospital in Washington, under the control of Navy officers, that Kennedy’s autopsy was performed, after his body had been literally stolen at gunpoint from Parkland Hospital in Dallas. The report of this autopsy stated that the fatal bullet had entered the back of Kennedy’s skull, which contradicted the testimonies of twenty-one members of the Dallas hospital staff who saw two entry bullet-wounds on the front of Kennedy’s body. This was critical because Oswald was presumably shooting from behind Kennedy, and could not possibly have caused these bullet wounds. It is noteworthy that Johnson had actually taken advantage of his connections in the Navy to participate in the greatest corruption case ever recorded at that time. His accomplice Fred Korth was forced to resign as Navy Secretary in November 1963, only weeks before the Dallas coup, after the Justice Department headed by Robert Kennedy had implicated him in a fraud involving a $7 billion contract for the construction of 1,700 TFX military aircraft by General Dynamics, a Texas company. Johnson’s personal secretary, Bobby Baker, was charged in the same case. Because of this mounting scandal and other suspicions of corruption, Kennedy was determined to change Vice-President for his upcoming reelection campaign. While in Dallas the day before the President’s visit, Nixon publicized the rumor of Johnson’s removal, and the Dallas Morning News was reporting on November 22nd: “Nixon Predicts JFK May Drop Johnson.” Instead, Johnson became president that very day. He said that he feared that his act would be used “to create some falsehood about some of the Jewish faith,” but added that “maybe something can be saved […], if our President, Lyndon Johnson, knew the truth from me.”  With such words, Ruby seems to be trying to send a message to Johnson through the Commission, or rather a warning that he might spill the beans about Israel’s involvement if Johnson did not intervene in his favor. We get the impression that Ruby expected Johnson to pardon him. Ruby died from a mysterious disease in his prison in 1967. Thanks to JFK’s death, Israel was also able to carry out its plan to annex Palestinian territories beyond the boundaries imposed by the United Nations Partition plan. By leaning on Pentagon and CIA hawks, Johnson intensified the Cold War and created the climate of tension which Israel needed in order to demonize Egyptian president Nasser and reinforce its own stature as indispensable ally in the Middle East. During the Six Day War of 1967, Israel managed to triple its territory, while creating the illusion of acting in legitimate defense. The lie could not deceive American Intelligence agencies, but Johnson had given a green light to Israel’s attack, and even authorized James Angleton of the CIA to give Israel the precise positions of the Egyptian air bases, which enabled Israel to destroy them in just a few hours. Four days after the start of the Israeli attack, Nasser accepted the ceasefire request from the UN Security Council. It was too soon for Israel, which had not yet achieved all its territorial objectives. On June 8, 1967, the USS Liberty, a NSA spy ship stationed in international waters off Sinai, was bombed, strafed and torpedoed during 75 minutes by Israeli Mirage jets and three torpedo boats, with the obvious intention of sinking it without leaving any survivors. (Even the rescue channels were machine-gunned.) Meanwhile, Johnson, from the White House, intervened personally to prohibit the nearby Sixth Fleet from rescuing the USS Liberty after the crew, despite the initial destruction of its transmitters, had managed to send off an SOS. The attack would have been blamed on Egypt if it had succeeded, that is, if the ship had sunk and its crew had all died. The operation would then have given Johnson a pretext for intervening on the side of Israel against Egypt. But it failed. The USS Liberty affair was suppressed by a commission of inquiry headed by Admiral John Sidney McCain II, Commander-in-Chief of US Naval Forces in Europe (and Father of Arizona Senator John McCain III). Johnson accepted Israel’s spurious “targeting error” explanation. In January 1968 he invited the Israeli Prime Minister, Levi Eshkol, to Washington, and warmly welcomed him to his Texas ranch. What’s more, Johnson rewarded Israel by lifting the embargo on offensive military equipment: US-made tanks and aircraft immediately flowed to Tel Aviv. This failed false flag attack is evidence of the secret complicity of Johnson and Israel, implying high treason on the part of Johnson. Let’s now conclude our overview of the evidence: beside the fact that John and Robert were brothers, their assassinations have at least two things in common: Lyndon Johnson and Israel. First, their deaths are precisely framed by Johnson’s presidency, which was also the context for other political assassinations, such as Martin-Luther King’s. Johnson was in control of the State during the two investigations on John and Robert’s murders. Secondly, in both cases, we find the fingerprints of Israel’s deep state. In the case of Robert, it is the choice of the manipulated patsy, which was obviously meant to disguise Robert’s assassination as an act of hatred against Israel. In the case of John, it it is the identity of the man asked to kill the patsy, a Jewish gangster linked to the Irgun. Johnson and Israel, the two common elements in the Kennedy assassinations, are themselves closely linked, since Johnson can be considered as a high-level sayan, a man secretly devoted to Israel, or owned by Israel, to the point of committing high treason against the nation he had been elected to lead and protect. The causal link between the two assassinations then becomes clear: even if Robert had been pro-Israel, which he was not, Israel and Johnson would still have had a compelling reason to eliminate him before he got to the White House, where he could—and would—reopen the investigation on his brother’s death. What should have been obvious from the start now appears brightly clear: in order to solve the mystery of the assassination of John Kennedy, one has simply to look into the two other assassinations which are connected to it: the assassination of Lee Harvey Oswald, the man whose trial could have exposed the hoax and possibly put the plotters into the light, and the assassination of Robert Kennedy, the man who would have reopened the case if he had lived. And both these assassinations bear the signature of Israel. At his death in 1968, Robert Kennedy left eleven orphans, not counting John’s two children, whom he had somewhat adopted. John’s son, John F. Kennedy Jr., aka John John, who had turned three the day of his father’s funeral, embodied the Kennedy myth in the heart of all Americans. The route seemed traced for him to become president one day. He died on July 16, 1999, with his pregnant wife and his sister-in-law, when his private plane suddenly and mysteriously nose-dived into the ocean a few seconds after he had announced his landing on the Kennedy property in Massachusetts. John John had long been portrayed as a superficial, spoiled and harmless young man. But that image was as misleading as young Hamlet’s in Shakespeare’s play. John had serious interests in mind, and, at age 39, he was just entering politics. In 1995 he founded George magazine, which seemed harmless until it began to take an interest in political assassinations. In March 1997, George published a 13-page article by the mother of Yigal Amir, the convicted assassin of Israeli Prime Minister Yitzhak Rabin. The article was supporting the thesis of a conspiracy by the Israeli far-right. So JFK Jr. was eliminated while following in the footsteps of his father, entering politics through the door of journalism and taking an interest in the crimes of the Israeli deep state. Canadian-Israeli journalist Barry Chamish believes John Kennedy Jr. was assassinated precisely for that. The nonsensical notion of a mysterious curse on the Kennedy family is an obvious smoke screen. The unsolved murders of JFK and his two legitimate heirs—his younger brother and his only son—require a more rational explanation. The sense that the official stories about their deaths amount to a huge cover-up is obsessing the American psyche, a bit like a repressed family secret affecting the whole personality from a subconscious level. President John Kennedy and his brother are heroic, almost Christ-like figures, in the heart of a growing community of citizens who have become aware of the disastrous longtime effect of their assassinations. Only when the American public at large come to grips with the truth of their deaths and honor their legacy and sacrifice will America have a chance to be redeemed and be great again. 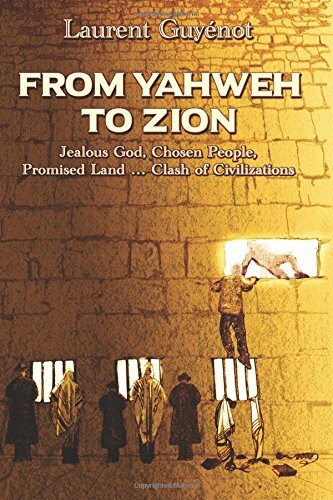 Laurent Guyénot is the author of JFK-9/11: 50 years of Deep State, Progressive Press, 2014, and From Yahweh to Zion: Jealous God, Chosen People, Promised Land … Clash of Civilizations, 2018. ($30 shipping included from Sifting and Winnowing, POB 221, Lone Rock, WI 53556). Lance deHaven-Smith, Conspiracy Theory in America, University of Texas Press, 2013,kindle 284-292. John Lewis’ testimony is in the PBS documentary American Experience Robert F. Kennedy. David Talbot, Brothers: The Hidden History of the Kennedy Years, Simon & Schuster, 2007, p. 278-280, 305. David Talbot, Brothers, op. cit., 2007, p. 21-22. David Talbot, Brothers, op. cit., p. 25-7. James Hepburn, Farewell America: The Plot to Kill JFK, Penmarin Books, 2002, p. 269. David Talbot, Brothers, op. cit., p. 312-314. Philip Melanson, The Robert F. Kennedy Assassination: New Revelations On the Conspiracy And Cover-Up, S.P.I. Books, 1994, p. 25. For a full overview, watch Shane O’Sullivan’s 2007 investigative documentary RFK Must Die: The Assassination of Bobby Kennedy. For more detail, read his book Who Killed Bobby? The Unsolved Murder of Robert F. Kennedy, Union Square Press, 2008. See also Don Schulman’s testimony in The Second Gun (1973), from 42 min 40. Shane O’Sullivan, Who Killed Bobby? The Unsolved Murder of Robert F. Kennedy, Union Square Press, 2008, p. 5, 44, 103. David B. Green, “Brainwashing and Cross-dressing: Israel’s Assassination Program Laid Bare in Shocking Detail,” Haaretz, February 5, 2018. Ronald Kessler, The Sins of the Father: Joseph P. Kennedy and the Dynasty He Founded, Hodder & Stoughton, 1996. Jeffrey Salkin, “Remember What Bobby Kennedy Died For,” op. cit..
 Michael Collins Piper, False Flag, op. cit., p. 78. Tom Mangold, Cold Warrior: James Jesus Angleton: the CIA’s Master Spy Hunter, Simon & Schuster, 1991, p. 318. Michael Howard Holzman, James Jesus Angleton, the CIA, and the Craft of COunterintelligence, University of Massachusetts Press, 2008, p. 153. “Assassination studies Kennedy knew a coup was coming,” on Youtube. Image of Arthur Krock’s article is shown on http://www.youtube.com/watch?v=snE161QnL1U at 1:36. “Harry Truman Writes: Limit CIA Role to Intelligence,” Washington Post, December 22, 1963, quoted in Mark Lane, Last Word: My Indictment of the CIA in the Murder of JFK, Skyhorse Publishing, 2011, p. 246. Thomas Troy, “Truman on CIA,” September 22, 1993, on http://www.cia.gov ; Sidney Krasnoff, Truman and Noyes: Story of a President’s Alter Ego, Jonathan Stuart Press, 1997. Michael Collins Piper, False Flags: Template for Terror, American Free Press, 2013, p. 67. James Douglass, JFK and the Unspeakable: Why He Died and Why It Matters, Touchstone, 2008, p. 46. Meir Doron, Confidential: The Life of Secret Agent Turned Hollywood Tycoon – Arnon Milchan, Gefen Books, 2011, p. xi. Mickey Cohen, In My Own Words, Prentice-Hall, 1975, p. 91-92. Michael Collins Piper, Final Judgment: The Missing Link in the JFK Assassination Conspiracy, American Free Press, 6th ed., ebook 2005, p. 133-155, 226. Bryan Edward Stone, The Chosen Folks: Jews on the Frontiers of Texas, University of Texas Press, 2010, p. 200. John Hughes-Wilson, JFK-An American Coup d’État: The Truth Behind the Kennedy Assassination, John Blake, 2014. Natasha Mozgovaya, “Prominent Jewish-American politician Arlan Specter dies at 82,” Haaretz, October 14, 2012, on http://www.haaretz.com. Alan Hart,Zionism: The Real Enemy of the Jews, vol. 2: David Becomes Goliath, Clarity Press, 2009, p. 273. Warren Bass, Support any Friend: Kennedy’s Middle East and the Making of the U.S.-Israel Alliance, 2003, p. 219. Quoted in George and Douglas Ball, The Passionate Attachment: America’s Involvement With Israel, 1947 to the Present, W.W. Norton & Co., 1992, p. 51. Philip Muehlenbeck, Betting on the Africans: John F. Kennedy’s Courting of African Nationalist Leaders, Oxford UP, 2012. Phillip Nelson, LBJ: The Mastermind of JFK’s Assassination, XLibris, 2010, p. 372. Quoted in Phillip Nelson, LBJ: The Mastermind, op. cit., p. 17. Seymour Hersh, The Samson Option: Israel’s Nuclear Arsenal and American Foreign Policy, Random House, 1991, p. 94-97. Arthur Schlesinger, A Thousand Days: John Kennedy in the White House (1965), Mariner Books, 2002, p. 56; Alan Hart, Zionism, vol. 2, op. cit., p. 257. Phillip Nelson, LBJ: The Mastermind, op; cit., p. 320. Morris Smith, “Our First Jewish President Lyndon Johnson? – an update! !,” 5 Towns Jewish Times, April 11, 2013, on 5tjt.com. Stephen Green, Taking Sides: America’s Secret Relations With a Militant Israel, William Morrow & Co., 1984, p. 166. Barry Chamish, “The Murder of JFK Jr – Ten Years Later,” www.barrychamish.com (also on: www.rense.com/general87/tenyrs.htm). Much of the study of Islamophobia is directed at the social and political causes and manifestations, including religious and political dimensions and racist characteristics. However, Islamophobia is also used as a strategic tool or weapon; i.e., in pursuit of national agenda. Many of us are familiar with Islamophobic movements within the Buddhist majority in Myanmar (against the Rohingya minority), and within Hindu nationalist parties in India. It is important to note, however, that it is characteristic of these movements that they direct their Islamophobia against particular groups of Muslims within their own societies, and are less concerned with creating an international movement against Islam. This is what makes the case of Israel unique. Although Israel, like Myanmar and India, seeks to marginalize and ultimately eliminate a specific population of Muslims – in this case the mostly Muslim Palestinians – part of its strategy for doing so includes encouraging and fostering Islamophobia internationally. Thus, for example, Israel has successfully pursued strong military and diplomatic ties with the governments of Myanmar and India, and especially the Islamophobic movements within those countries. It is clear, therefore, that Islamophobia within Israel is not only a matter of organized bigotry and social hatred, which one finds in other societies, but also of instrumentalizing or weaponizing Islamophobia as a strategic tool to legitimize and justify the ethnic cleansing of Palestinians in the territories under Israel’s control, as well as to support Israeli aggression towards other mostly Muslim countries in the region. Promoting and fostering Islamophobia internationally helps to increase and solidify international support for the Zionist genocidal project. It is therefore treated as an important tool of Israeli and Zionist international influence. My attention was first brought to this fact in casual but unusual circumstances. In early 1993 my family and I were on vacation at a Club Med in France where there were also Israeli intelligence officers and their families. I got into a discussion with one in particular, who said that with the fall of the Soviet Union, Islam would replace communism as the new enemy. It sounded a bit far-fetched, but in retrospect he knew what he was talking about, and more important, he was in a position to help make it happen, which of course it did. Since then, researchers like Sarah Marusek, David Miller and others have cataloged international Zionist networks that sponsor Islamophobic propaganda and policies. The work of Pamela Geller and the so-called American Freedom Defense Initiative is one of the well-known examples. Geller’s anti-Islam billboards and bus advertisements are familiar to many, as well her so-called “Muhammed Art Exhibit and Contest” in Garland, Texas in 2015, resulting in the police killing of two armed men. Geller is hardly alone, however. According to the Center for American Progress, the US has six major organizations that manipulate Islamophobia in order to further US support for Israel. These are the Center for Security Policy, the Society of Americans for National Existence, the Middle East Forum, Jihad Watch, Stop Islamization of America, and the Investigative Project on Terrorism. Sarah Marusek includes even more groups in her paper entitled “The Transatlantic Network: Funding Islamophobia and Israeli Settlements”, published in the anthology, What is Islamophobia? These organizations constitute a network, as Marusek says, but the complete network is much wider and more diverse than the assets concerned with promoting Islamophobia. They are known as the sayanim, the Hebrew word for helpers or assistants, and are composed of Zionists who have achieved important and useful positions in societies from which they can exercise powerful initiatives, especially when they operate in concert. Thus, for example, friendly journalists can work with lobbyists and others to quickly and massively spread influence, information, analysis and disinformation that are useful to Israel. Such initiatives require coordination, intelligence, strategic planning, covert action, technical assistance, and other expertise. For many years, the sayanim were coordinated by the Mossad. However, following a 2010 report from the influential Reut Institute (a prestigious strategic think tank in Israel), organizational changes were made that moved such responsibility to the Ministry of International Relations, Intelligence and Strategic Affairs – better known as the Ministry of Strategic Affairs. The report also notes that there are as many as 4,000 sayanim in each of the major centers of power and influence, such as London and New York. A concentration of sayanim in important sectors of society that inform the public, such as film, entertainment, journalism, education and social media permits them to help shape public opinion. In line with Reut Institute recommendations, the Strategic Affairs Ministry has grown in size and secrecy over the last decade. Reut projected that Israel’s main strategic threat would no longer be to its military security but rather to its image and influence in other countries, especially the US and Europe. According to this view, BDS was to be regarded as a serious threat, as well as the human rights NGOs, Palestine solidarity groups and the critical alternative press. The Ministry of Strategic Affairs was therefore selected to coordinate a major new effort to combat this perceived threat. The Strategic Affairs Ministry has informally been called the Hasbara Ministry, using the Hebrew word for explanation or propaganda. It certainly is that, but also much more. The reorganization of the Strategic Affairs Ministry can be compared in scope to that of the Homeland Security Department. A lot of security and intelligence functions were transferred from or shared with Mossad. The Ministry became responsible for propaganda, influence and manipulation in other countries. Coordination of the sayanim became part of its purview, as did thousands of students who were paid or received scholarships in return for haunting social media and the comments sections of websites. The purpose was to dominate the media, insofar as possible, in countries vital to Israel’s plans and intentions, and to sway public opinion toward outcomes determined by Israel’s strategic goals. Many readers are familiar with the “Brand Israel” campaign. Its function, suggested by the Reut Institute, is to mold Israel’s image in the media of the US and other countries. Its tactics are PR on steroids, such as, for example, slipping subliminal questions into the Jeopardy quiz program and idyllic holy land vacations into Wheel of Fortune, but permeating nearly everything we see, hear and read in film, entertainment, journalism, education and social media for the purpose of molding public opinion. With enough effort of this kind, we will presumably think of Israel as Disneyland. Another example is Facebook and the personal collaboration between Mark Zuckerberg and Benjamin Netanyahu. After a meeting with Netanyahu, Zuckerberg hired a former employee at the Israeli embassy in Washington to be in charge of censoring so-called “fake news” on Facebook. Only Facebook has the actual figures of who gets censored, but anecdotal evidence seems to indicate that a lot more anti-Zionists than Zionists are affected. Similarly, Islamophobic postings and Tweets seem to be at least somewhat resistant to censorship compared to ones that are labeled anti-Semitic (which are often merely critical of Israel). But it’s not just about making Israel look like the good guys. Demonizing and dehumanizing Muslims also helps to justify Israel’s genocide of the Palestinians, as well as its belligerent policies toward its mainly Muslim neighboring countries. A successful program of Islamophobia helps to support Israel’s pogroms of Palestinians in Gaza, its settlements in and economic strangulation of the West Bank, its invasions of Lebanon, its attacks against Syria, and its promotion of US wars against Afghanistan, Somalia, Iraq, Libya and Syria. Making the US military a proxy for Israel greatly multiplies Israel’s capability, which is why Israel and its US lobby are working hard to create a new international war against Iran. In order to provide the Strategic Affairs Ministry with all possible means of making such operations possible and successful, it has been assigned some important intelligence functions, including black ops and psy-ops capabilities, which used to be the exclusive purview of the Mossad. This gives the ministry greater capability to engage in digging up or inventing dirt about people it wants to harm or discredit, especially in the BDS movement and other pro-Palestinian groups. The hand of the Strategic Affairs Ministry is not always obvious, and it takes care to shun the light. But occasionally its actions become known, as with the Aljazeera exposé of Israeli operative Shai Masot, working from the Israeli embassy in London and coordinating the actions of British citizens working with Israel. He coached them on how to demonize and “take down” members of parliament, including the Foreign Office Minister, Alan Duncan, who was considered insufficiently supportive of the effort to suppress BDS. Al Jazeera has produced a similar exposé on the workings of Israel and its US lobby, but the release has been indefinitely delayed, which may be an indication of Israel’s power and influence and the effectiveness of the operations coordinated by the Strategic Affairs Ministry. Nevertheless, a glimpse of such operations can be seen in the 2004 espionage indictments against AIPAC lobbyists Steve Rosen and Keith Weissman. The indictments were ultimately dropped, partly because sensitive information would have to be revealed in order to successfully prosecute the cases (or perhaps that was just the excuse used to cover the fact that Tel Aviv gets to decide who gets prosecuted, not Washington). France can be considered an extreme case. People have been arrested there for wearing a Free Palestine T-shirt. PayPal and several large banks in France recently closed the accounts of all organizations that support BDS, which has been ruled anti-Semitic. Anti-Semitism is broadly defined, as you can see, and it is illegal in France. You can be fined or jailed for practicing it. But not for Islamophobia. Islamophobia is free speech but anti-Semitism is racism. In fact, the French equivalent of AIPAC, known as CRIF, has publically declared that “Islamophobia is not a form of racism. We have long drawn attention to the danger of conflating Islamophobia and anti-Semitism. To do so would impede all criticism of Islam, such that the fundamental rights of [other] religions could not be respected. The CRIF will therefore block all resolutions against Islamophobia”. The writings of Jacob Cohen are instructive in this regard. He has published a remarkable and very comprehensive exposé on the promotion of Islamophobia in France, including the actions of Israeli operatives and French Zionist organizations. But there’s a catch. In order to publish it in France without being arrested or sued, he has to disguise it as very thinly veiled fiction, in this case O.P.A. Kabbalistique sur les Nouveaux Indigènes. It is available only in French, but even in that language you have to know the persons and groups to which he refers with pseudonyms, and few outsiders know the French scene well enough to recognize more than a handful of them. So what can we conclude from all this information about the involvement of Israel and the Zionist movement in sponsoring Islamophobia? The point is that some sources of Islamophobia are not attitudes or social structures. We have to face the fact that there is a very potent, resourceful, well organized and well funded international movement that sees Islamophobia as a strategic tool in pursuit of its national interest. For this reason, it is largely impervious to education or negotiation or legal considerations. In fact, Israel is also pursuing an apparently contradictory effort to encourage interfaith cooperation between Jews, Muslims and Christians, but with the same goal in mind. That goal is to blunt criticism of Israel, whether by getting people to hate Muslims and thereby endorse Israel’s belligerence and ethnic cleansing, or by pressuring Muslims not to criticize Israel out of concern for potentially offending their Jewish brothers and sisters. Since the two strategies are aimed at different populations, I suppose that they might be able to work simultaneously. This is often how PR campaigns work. The point is that in all the efforts at fostering tolerance and understanding we are faced with an adversary that is working quite diligently in the opposite direction for reasons that have nothing to do with how they view Islam as a religion or Muslims. This is therefore a different type of challenge in trying to overcome Islamophobia. • This article is a revised version of a paper read at the 9th Annual Islamophobia Conference in Berkeley, California, April 29, 2018. On Wednesday, a US court ordered Iran to pay billions of dollars to the families of those killed in the September 11 terrorist act. The ruling is part of a larger case being pursued by the families against Saudi Arabia for its alleged role in the 2001 terrorist attacks. Tehran has strictly condemned the decision made by the US court, which had ruled that Iranian authorities have to pay compensations to the relatives of the victims of the September 11 attacks, according to a statement by the Iranian Foreign Ministry’s spokesperson Bahram Kasemi. “The court’s decision is unacceptable and rejected, it is not only a mockery of the system of international law, but also a mockery of the American people, especially the victims of the September 11 attacks and their families,” the diplomat stressed. “The government of Iran reserves the right to object to this illegal court proceedings,” the spokesman added. On Wednesday, the US court ordered Iran, the Islamic Revolutionary Guard Corps (IRGC) and the Central Bank of Iran to pay billions of dollars in compensation to the relatives of the victims of the September 11 attacks, since they were found guilty of killing more than 1,008 people. The decision was taken despite the fact that the special investigation commission had not previously established direct evidence of Iran’s involvement in the terrorist act. The families of those killed in the attacks on September 11, 2001, in New York filed a lawsuit against the Iranian authorities in 2004. I was on WGN for a live interview last week, and was asked to speak about my work and my book, but when I gave answers the hosts didn’t like, their questions (and comments) started to get hostile, literally telling me I “don’t sound American.” They gave me 5 minutes on-air. I’m going to give myself this short article instead. Here are a few quick thoughts about this interview (which they also did not publish online, or give us access to the clip), as I feel it serves as a good example for a bit of commentary that can be applied to so many conversations happening now, and relevant to the work that is happening here on JooJoo Azad. This question is assuming that there was, in fact, a time in recent Iranian history where women were wearing miniskirts and not hijabs as if there were no Muslim people in Iran before the revolution or that everyone is wearing black now and all sense of personal expression has been stripped from them. So wearing a black chador is not “expressing yourself”? Is expression of self through the body truly only limited to dressing in Western fashion? For more elaboration on my response, a dear friend Alex Shams wrote a brilliant piece: “The Weaponization of Nostalgia, How Afghan Miniskirts Became the Latest Salvo in the War on Terror”, discussing how this exact dichotomous framework of seeing women’s bodies in the middle east (mini skirts as freedom and liberation and hijabs as repression and lack of rights) is established as justification for keeping troops on the ground in Afghanistan. Fashion is powerful, but it’s not a gauge of a state’s morality or progress based on how it frames women’s bodies. So hindsight is always 20/20, and I honestly should have just stopped him right there and questioned why he thought it was okay to make this ridiculous comment and pose it as a question (I think I was too excited to answer the question than question his premises). Nothing to do with what we are talking about and yet, I’m forced to take up a role as an expert on all things related to Iranian politics — a position I know other POC/Muslims have found themselves in if they have ever been the token Muslim on a panel or interviewed about their work. The title they gave me on the show was “fashion blogger,” yet here I am being asked about nuclear weapons. Would they ever bring on a white chef to their show and then ask him about Brexit or his thoughts on the rise of white supremacy? Clearly, this is not the interview they expected. Identifying me as an Iranian-American, just moments before they wanted me to swiftly and unquestionably denounce Iran and then am immediately called out for not blindly pledging to the USA. Of course, both countries deserve their questioning, but the double standards is mind-blowing. Not to mention that what, then, must an American “sound like”? Are they saying that Americans must not question their government, must see the world in black & white, and chose simplicity over nuanced understandings? In that case, you all are doing it right. But furthermore, what an incredibly loaded statement to say to a visibly Muslim woman on live TV, pushing every stereotype of “other”, “foreign”, and “incompatible with America” that Muslims are so systematically characterized as–and therefore used as justification to commit violence against, both here and abroad. If a white person said the same things as I did I guarantee you their “American-ness” would not have been questioned. This is also why I work with the medium of fashion/art — images and image production (such as the American Flag Hijab) are not just abstract, harmless “expressions” but truly are so deeply connected to our understandings of ourselves and others. I could go on, but I think these three points in particular work to highlight the absurdity of this interview the best. Thank you Heba & Nausheen for literally buying this interview from a third party so I could share and dissect it. Also shout-out to whatever editing/lighting that was done to make my skin look a few shades darker. The editor of a prominent Jewish community newspaper has come under strong attack for making a joke about a war in which more than a million Iranians and Iraqis lost their lives. Stephen Pollard, editor of Britain’s Jewish Chronicle, now stands accused of inciting hatred and bigotry following a tweet in which the staunchly pro-Israel and equally enthusiastic Tottenham Hotspur fan compared the Premier League game between Chelsea and Arsenal yesterday to the war between Iran and Iraq because he wanted both sides to lose. Other twitter users condemned the JC editor for his insensitive and callous remarks about a war in which more than a million people were killed. Others described the comment as “vile” and “disgusting”. Many were keen to point out the latent racism displayed by Pollard. “You despicable man. A million people died & you make fun of them? Is this implicit #Islamophobia coming out? If someone had made such a hideous analogy with Israel etc you’d be crying antisemitism. Truly hideous man”. “His hate and contempt for Arabs and Muslims is so obvious. And this is the editor of a major Jewish paper!” wrote another angry user. It is reasonable to surmise that the Indian decision to vote in the UN General Assembly on Thursday against the US president Donald Trump’s recognition of Jerusalem as the capital of Israel would only have been taken at the level of Prime Minister Narendra Modi. India has been largely harmonizing its foreign policies with Washington through the past decade. And, to boot it, the Trump administration has openly threatened to punish any country that voted against it. Generally speaking, bureaucrats in the South Block wouldn’t jeopardize their career – or their post-retirement assignments by annoying the Americans. (Read WikiLeaks and you’ll learn more about it.) Conceivably, therefore, they would have passed the Jerusalem buck to the PMO where it was lying until the PM got back from the Gujarat campaign. Then, there is the personal bonding between Modi and Israeli PM Benjamin Netanyahu (who is expected to pay a week-long visit to India in January.) Won’t ‘Bibi’ take it amiss? Frankly, that is a non-issue. The arms sales to India constitute a significant source of budgetary support for Israel. Israelis are a very pragmatic lot. The Haaretz newspaper recently featured a lengthy article highlighting the RSS and affiliated Hindu nationalists as an exotic breed who adore Adolf Hitler and subscribe to the Nazi ideology. But has that prevented Israel from doing business with the Modi government? Of course not. A third aspect is about the ideological affinities devolving upon Islamophobia between the present Indian ruling elite and their Israeli counterparts. Thus, all in all, Modi took a bold decision. Neither academics who claim expertise in West Asian studies nor diplomats who extensively served in the region – or, even ministers in Modi’s cabinet – probably expected him to take such a bold decision. No doubt, Modi took a wise decision. India has a relationship with West Asia that goes far beyond the regimes in those countries. The West Asian region is in transition, in a historical sense, and India is doing the right thing by taking into account the groundswell of popular opinion over the Jerusalem question. This is one of those rare opportunities available for India to position itself in terms of time past, time present and time future. As a shrewd political mind, Modi senses it. Diplomacy is far from a cynical process. The importance of principles cannot but be stressed if foreign policy is to be durable and sustainable. Good diplomacy is about maneuvering and negotiating to safeguard interests, but without jettisoning principles. In such a sense, India has had a principled stance on the Palestine issue, which it has maintained even while developing a pragmatic ‘win-win’ relationship with Israel through the past quarter century. India cannot and should not identify with Zionism. Ironically, there is a very significant body of opinion even amongst Jews who find Zionism to be repugnant as an ideology. Evidently, Trump is putting immense pressure on Saudi Arabia. Trump telephoned Saudi King Salman on Wednesday to rev up the anti-Iran campaign, again. But, interestingly, on the very next day, Salman phoned Russian President Vladimir Putin. (Kremlin readout) Saudi Arabia is doing a delicate balancing act. It cannot afford to displease Trump, given the stark realities of the petrodollar. But it increasingly feels he’s a blood sucker and wants to put some space in between. One gets the impression that Saudis want to focus on their own transition and the much-needed internal restructuring. They hope to get a helping hand from Putin to work out an exit strategy in Yemen. Israel, on the other hand, is spreading exaggerated reports at regular intervals – largely through sly remarks and innuendos –that it is having a quiet affair with Saudi Arabia’s Crown Prince. It is a disinformation game that Israelis are good at playing. And they have nothing to lose anyway. Suffice to say, Jerusalem is the tip of an iceberg. But looking ahead, Trump’s Iran project is doomed to fail. Unless Israel fundamentally reorients its own strategies (which seems unlikely under Bibi), its own future may become uncertain. Iran and Turkey (plus Egypt, if it can get its act together) are the only two authentic regional powers in the Middle East. This geopolitical reality will manifest – if not already – as time passes. Therefore, keeping the relations with Israel at a transactional level without harboring romantic notions about it is the prudent thing to do. House Concurrent Resolution 81 (H.Con.Res.81) is sponsored by Representatives, Ro Khanna (D-Calif.), Walter Jones (R-NC), Mark Pocan (D-Wisc. ), Thomas Massie (R-KY), and 39 other lawmakers. The resolution commands an end to U.S. participation in the Saudi-led war in Yemen. The sponsors of this resolution contend that such participation, which began in March 2015, was never authorized under the War Powers Act of 1973. Per the War Powers Act, any congressman can pose a legal challenge and is guaranteed a floor vote on the issue. This is known as a privileged resolution. On November 1st, the night before the vote was scheduled to take place, House leadership swiftly pushed through a Rules Committee vote, denying the resolution’s privileged status. Thus, preventing the guaranteed floor vote. What was their justification? Apparently, the House Rules Committee feels that the war in Yemen has yet to ‘rise to a level’ where the War Powers Act is applicable. After preventing the vote on H.Con.Res.81, the House Leadership has said it shall permit a ‘compromise’ resolution on the war in Yemen. The debate, scheduled for the week of November 13th, will discuss the legality of U.S. involvement in the war. The vote will be non-binding. Therefore the War Powers Act, clearly applies to the war on Yemen. The House leadership is lying to the American people, supporting the continuation of the world’s worst humanitarian crisis, violating the War Powers Act, and attempting to prevent Congress from stopping yet another illegal and unconstitutional war. Conservatively, since the beginning of 2017, at least 10,000 people have been killed in this war. The heroic and indispensable Yemeni journalist Nasser Arrabyee has said the toll could be as high as 60,000 deaths. The Saudis are ruthlessly bombarding the Yemenis and their civilian infrastructure. The coalition wants to cripple the people of Yemen to the point of submission. Their end goal is to force Yemen’s civilians to stop supporting the northern tribesmen if only to alleviate their suffering. U.S. involvement is most critical to the Saudi effort in this war. The U.S. military is training Saudi Arabian forces. The U.S. is refueling the coalition’s warplanes not just in the air with tanker sorties, but also on its bases peppered throughout the region. Donald Trump, doing his best Barack Obama impression, has been more than happy to sell the Saudis hundreds of billions of dollars worth of weapons to continue their genocide. These include planes, ships, rockets, precision-guided bombs, cluster bombs, etc. American defense contractors, particularly Lockheed Martin and Boeing, are likewise more than happy to rake in their handsome profits from Yemen’s destruction. With Jared Kushner playing the role of matchmaker for Mohammed bin Salman and Marillyn A. Hewson (CEO of Lockheed), the profits will surely escalate. However, the Saudis have another powerful ally in this war, al Qaeda. This certainly makes the upcoming debate on Yemen a great opportunity for the House to finally get around to discussing the legality of high treason. Or more specifically, fighting another war for al Qaeda. In addition to the coalition’s sadistic air campaign, Yemini civilians are threatened and attacked on the ground day in and day out by Sudanese mercenaries, al Qaeda in the Arabian Peninsula (AQAP), and a local Islamic State affiliate. All of whom support the coalition. This is further evidence that U.S. involvement in the Saudi war is illegal. When asked for a justification for U.S. involvement in the Saudi/UAE war, both Barrack Obama and Donald Trump’s administrations have cited the 2001 Authorization for the Use of Military Force (AUMF). That AUMF permits military action only against those entities who perpetrated the attacks on 9/11. In other words, military action is only permitted against al Qaeda. Yet, this war is being fought on behalf of al Qaeda against their enemies, the Houthis. Indeed, Asher Orkaby made the point in Foreign Affairs that, “far from being aligned with extremists, the Houthi movement has repeatedly clashed with the Islamic State and AQAP”. So, in addition to the fact that this war was never authorized under the War Powers Act, it is also clearly not covered under the current AUMF. Since the Obama administration, this is at least the third major conflict wherein the U.S. has found itself aligned with, fighting along side, arming, and/or supporting al Qaeda. This was official policy notably during the regime change operation in Libya and in the failed regime change operation in Syria. It is very important to note that if things had gone to plan in Syria, al Qaeda would have almost certainly taken Damascus. Neoconservatives are now calling for a new AUMF to explicitly define ‘the enemy’ more broadly as proponents of so called, ‘radical Islam’. The ‘radical Islam’ handle is a red herring callously promoted by the fake news establishment. It is meant to dumb down and obscure the realities of these conflicts for domestic audiences. The cynical neoconservatives are pleased to have Americans view all Arabs and Muslims as one homogenous and terrifying collective. Most Americans are designedly oblivious to the differences between Sunnis, Shiites, and other branches of Islam. It is in the interests of the War Party for American voters to see such radically opposed groups as Daesh and Hezbollah as cut from the same cloth. This is obviously done in order to prevent rational discussion of these conflicts from ever taking place. For if the American people were well informed of the consequences of U.S. policy abroad, especially in the Middle East, they would probably not even passively support their regime’s policies. In 2013, popular sentiment from people of all political stripes helped to prevent Obama’s would have been Iraq-style invasion of Syria. I believe one of the primary reasons for this was the effectiveness of the famous ‘I will not fight for al Qaeda in Syria’ social media campaign undertaken by active military personnel. Americans do not want to support and subsidize al Qaeda in Syria, Libya, Yemen, or anywhere else for that matter. The reason these horrific policies persist is not the peoples’ apathy, it’s their ignorance. This is a particularly indefensible war, even by U.S standards. If they choose to, this is a war the American people can end. The establishment is certainly not comfortable publicly debating and defending their Yemen policy. Exposing the realities of this conflict and ending the war in Yemen could trigger an anti-war domino effect. Not since the Vietnam War has there been more fertile soil for an American anti-war movement. Please continue to call your Congressmen and women and tell them to vote against the war on November 13th. Give them some good talking points for the debate. Please share, retweet posts from Yemenis on the ground, post news items, write blog posts, write articles, and speak your mind about the war in Yemen on social media. Do not be afraid to talk about the U.S.-Saudi/AQAP alliance. We have the truth on our side. Sixteen years after the event, 9/11 stands as striking evidence of an insidious assault on science. Officialdom’s dogged adherence to a discredited account of 9/11 stands as a stark illustration of this phenomenon. The subordination of scientific method to the higher imperatives of imperial war propaganda is epitomized by officialdom’s failure to formulate a credible account of the 9/11 debacle. Universities have become important sites of this betrayal. The sabotage of society’s primary platforms of scholarly enterprise forms an essential feature of a more pervasive attack from within. Everywhere, but especially on the Internet, fundamental freedoms to investigate, publish, publicize and discuss interpretations that might undermine or inconvenience power are being menaced. As a tenured full professor with 27 years of seniority at my home institution, I am currently facing a sharp attack on the remaining protections for academic freedom. In early October of 2016 the President of the University of Lethbridge, Michael J. Mahon, suspended me without pay. He also prohibited me from stepping foot on the University of Lethbridge campus. In explaining his actions Dr. Mahon’s speculated I might have violated a section of the Alberta Human Rights Act. The vagueness of this assertion exposes the reality that severe punishment was imposed without any proper investigation. Dr. Mahon’s abrupt deviation from the terms of the collective agreement with my faculty association has established precedents and countervailing responses with broad implications. Adversarial proceedings on this matter began this August in the Lethbridge Alberta Court House. As evidenced by the intervention of the 68,000 members of the Canadian Association of University Teachers, the outcome of this case will in all probability significantly affect the future of university governance in Canada and beyond. Before dealing with the manipulation of my Facebook wall in the prelude to my suspension, allow me to linger on questions concerning the academy and 9/11. Along with government, media and law enforcement agencies, universities are deeply implicated in sabotaging the quest for 9/11 truth and many other varieties of inconvenient truth as well. The punitive measures directed at me can be seen as a warning to scare other professors into compliance with all manner of official stories? As for my own reading of the available evidence, I am far from alone in positing that Israel First partisans, including the American neocons that dominated the Project for the New American Century, are prominent among the many protagonists of the 9/11 crimes. These crimes extend to orchestrating the media spin, rigging investigations, and sustaining the ongoing 9/11 cover-up. In publications and on False Flag Weekly News, Dr. Kevin Barrett and I have joined others in extending this investigative and interpretation trajectory into many cases of possible false flag terrorism particularly after 2001. I am astonished that the Administration of my University became so aggressive in attempting to outlaw an evidence-based interpretation of the most transformative event of the twenty-first century. New frontiers of subversion are being pioneered in the U of L’s audacious administrative attempt to criminalize independent academic work. What are the implications of subordinating the scholarly judgments of academic experts on campus to the executive dictates of administrators? How can the principles of critical thinking be cultivated when adherence to conformity is so aggressively enforced by administrators? This heinous assertion goes against everything I have tried to stand for in my life including in my academic work. As soon as I became aware of this blaspheme embedded in the planted Facebook post I publicly condemned it. By mid-September, however, my persecutors were far advanced in pushing forward the manufactured crisis. By then B’nai Brith Canada was mounting a petition campaign demanding that I be investigated, fired and silenced. None of my persecutors has yet identified the true source of the offending Facebook item. My own research into the matter, including my email exchange with cartoonist Ben Garrison, has led me to Joshua Goldberg. American Herald Tribune has published my article on this young man. Goldberg is widely reported to be the creator of many Internet personalities, all of whom generate abundant “hate speech deceptions” from various ethnic and ideological perspectives. Goldberg’s case exposes much about the wholesale manufacturing and misrepresentation of so-called “hate speech” to justify censorship on the Internet. In my case an atrocious digital item was strategically inserted with the aim of ruining me professionally and personally. The intervention of Internet leviathans like Google and Facebook is especially aggressive when it comes to disappearing material critical of the Israeli government’s treatment of Palestinians. My own experience with the Canadian branch of the Anti-Defamation League of B’nai B’rith points to the strength of this pattern. Why is it that this same Zionist organization is being tasked with the strategic responsibility of censoring and categorizing You Tube videos? As illustrated by William Pepper’s development of civil litigation to bring to light the US government’s role in the tragedy suffered by the family of Martin Luther King Jr., we rarely get criminal trials pressed against the world’s most powerful interests and operatives. Instances of possible false flag terrorism, but especially 9/11, have been rendered especially immune to any kind of trial that would put before the public evidence garnered from genuine investigations of facts. Perhaps the reference to 9/11 in a University Administration’s efforts to condemn me for academic thought crimes and speech crimes will force the forbidden topic into some kind of evidence-based juridical procedure. When it comes to understanding the real dynamics of who did what to whom on 9/11, the truth must prevail. Dr. Hall is editor in chief of American Herald Tribune. He is currently Professor of Globalization Studies at University of Lethbridge in Alberta Canada. He has been a teacher in the Canadian university system since 1982. The attacks of September 11, 2001 (9/11) left nearly 3,000 dead in NYC, Washington D.C. and over Pennsylvania. The attacks transformed America into a deepening police state at home and a nation perpetually at war abroad. The official narrative claims that 19 hijackers representing Al Qaeda took over 4 commercial aircraft to carry out attacks on New York City’s World Trade Center and the Pentagon in Washington D.C. The event served as impetus for the invasion and occupation of Afghanistan which continues to present day. It also led directly to the invasion and occupation of Iraq. Attempts to cite the attack to precipitate a war with Iran and other members of the so-called “Axis of Evil” (Libya, Syria, North Korea, and Cuba) have also been made. And if this is the version of reality one subscribes to, several questions remain worth asking. 1. Can the similarities between 9/11 and plans drawn up by the US Department of Defense (DoD) and Joint Chiefs of Staff (JCS) in 1962 under the code name “Operation Northwoods” be easily dismissed? 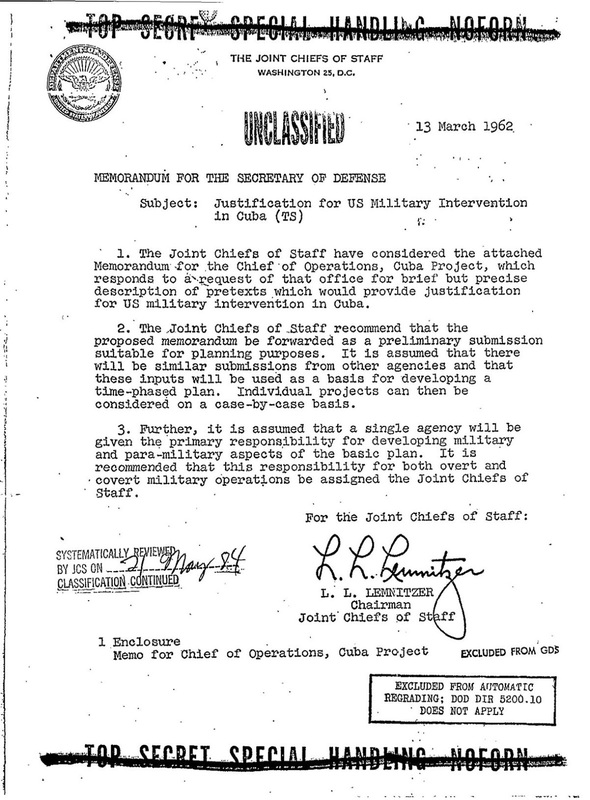 The US DoD and JCS wrote a detailed plan almost identical to the 9/11 attacks as early as 1962 called “Operation Northwoods” where the US proposed hijacking commercial airliners, committing terrorist attacks, and blaming Cuba to justify a US military intervention. In the early 1960s, America’s top military leaders reportedly drafted plans to kill innocent people and commit acts of terrorism in U.S. cities to create public support for a war against Cuba. Code named Operation Northwoods, the plans reportedly included the possible assassination of Cuban émigrés, sinking boats of Cuban refugees on the high seas, hijacking planes, blowing up a U.S. ship, and even orchestrating violent terrorism in U.S. cities. The plans were developed as ways to trick the American public and the international community into supporting a war to oust Cuba’s then new leader, communist Fidel Castro. An aircraft at Eglin AFB would be painted and numbered as an exact duplicate for a civil registered aircraft belonging to a CIA proprietary organization in the Miami area. At a designated time the duplicate would be substituted for the actual civil aircraft and would be loaded with the selected passengers, all boarded under carefully prepared aliases. The actual registered aircraft would be converted to a drone. The document also cites the USS Maine in describing the sort of event the DoD-JCS sought to stage, a US warship whose destruction was used to maliciously provoke the Spanish-American War. It should be noted, that unlike the DoD-JCS document’s suggestion that airliner-related casualties be staged, the USS Maine explosion killed 260 sailors. It is likely that DoD and JCS would not risk engineering a provocation that leads to major war but allow low-level operators left alive with the knowledge of what they had participated in. Considering that the US sought to deceive the public in order to provoke an unjustifiable war that would undoubtedly kill thousands or tens of thousands of innocent people, and that other proposals did include killing innocent people, it is worth considering that US policymakers would also be just as willing to extinguish innocent lives when staging the hijacking of aircraft to provoke such a war. 2. Why did US policymakers draw up extensive plans to reassert US global hegemony – including regime change in Afghanistan, Iraq, Iran, Libya, Somalia, Sudan, and Yemen – without any conceivable pretext until 9/11 conveniently unfolded? In 2000, US policymakers from the Project for a New American Century (PNAC) sought a sweeping plan to reassert America as a global hegemon. In a 90-page document titled, “Rebuilding America’s Defense: Strategy, Forces and Resources For a New Century” (PDF), a strategy for maintaining what it called “American military preeminence” would be laid out in detail. It involved global moves the United States – in 2000 – could never justify, including placing US troops in Southeast Asia, building a global missile defense network prohibited by treaties signed during the Cold War, and the containment of developing nations that would eventually end up rolling back US global hegemony in the near future, including Iran, Iraq, China, North Korea, Libya, and Syria. In fact, the entire body of the document is an uncanny description of the post-9/11 “international order,” an order unimaginable had the events of 9/11 not transpired. It should also be remembered that wars predicated on 9/11 like the invasion and occupation of Afghanistan, were admittedly planned before 9/11 took place. The day before the September 11 attacks, the Bush administration agreed on a plan to oust the Taliban regime in Afghanistan by force if it refused to hand over Osama bin Laden, according to a report by a bipartisan commission of inquiry. The report pointed out that agreement on the plan, which involved a steady escalation of pressure over three years, had been repeatedly put off by the Clinton and Bush administrations, despite the repeated failure of attempts to use diplomatic and economic pressure. While it seems inconceivable that the American or global public would tolerate the multi-trillion dollar 16 year war that the invasion of Afghanistan has become without the attacks on 9/11, such a war was admittedly in the making – in fact – years before 9/11 unfolded. Similarly, the invasion of Iraq in 2003 was strongly linked to the aftermath of 9/11, but was likewise decided upon long before 9/11 unfolded. The Bush administration began planning to use U.S. troops to invade Iraq within days after the former Texas governor entered the White House three years ago, former Treasury Secretary Paul O’Neill told CBS News’ 60 Minutes. This echos similar statements made by US Army General Wesley Clark who repeatedly warned that the US sought global-spanning war post-Cold War to assert its hegemony over the planet, and fully sought to use 9/11 as a pretext to do it. 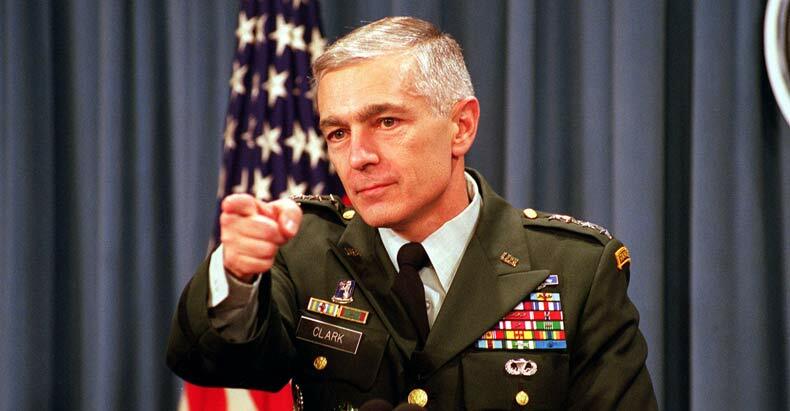 General Clark would list seven nations slated for regime change post 9/11, including Iraq, Iran, Libya, Somalia, Sudan, and Yemen – all nations now either at war or facing war with the United States and its proxies – or in the case of Libya – entirely divided and destroyed in the wake of US military operations. 3. If primarily Saudi hijackers with Saudi money and Saudi organization perpetrated the attacks of 9/11, why has the United States waged war or threatened war with every nation in the Middle East except Saudi Arabia and its allies? Not only has the United States made no moves against Saudi Arabia for its apparent role in the 9/11 attacks – spanning the administrations of US President George Bush, Barack Obama, and Donald Trump – the United States has sold Saudi Arabia billions in arms, provided military support and protection to Saudi Arabia’s military and government, partnered with Saudi Arabia in its ongoing conflict with Yemen – all while US government documents and leaked e-mails between US politicians reveal Saudi Arabia is still a state sponsor of Al Qaeda – the organization officially blamed for the 9/11 attacks. This “Salafist principality” is now known as the “Islamic State,” an affiliate of Al Qaeda still operating with significant state sponsorship everywhere from Syria, Iraq, and Libya, to the Philippines and beyond. Coincidentally, Saudi-armed and funded terrorists in the Philippines has served as a pretext for US military assets to begin expanding their presence in Southeast Asia, just as the aforementioned 2000 PNAC document had sought. 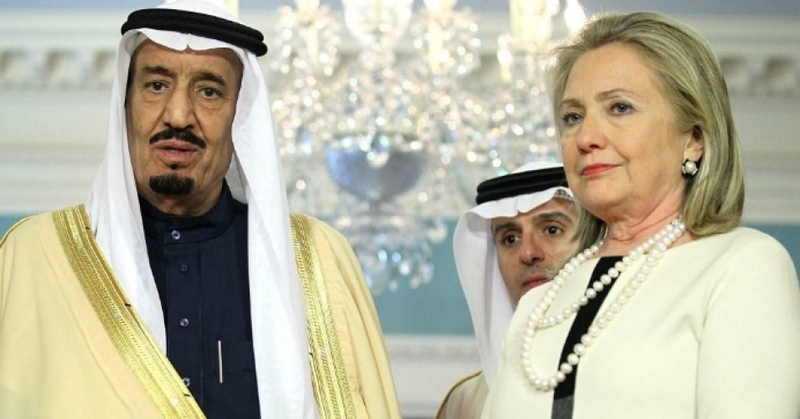 Additionally, in a 2014 e-mail between US Counselor to the President John Podesta and former US Secretary of State Hillary Clinton, it would be admitted that two of America’s closest regional allies – Saudi Arabia and Qatar – were providing financial and logistical support to the Islamic State. … we need to use our diplomatic and more traditional intelligence assets to bring pressure on the governments of Qatar and Saudi Arabia, which are providing clandestine financial and logistic support to [the Islamic State] and other radical Sunni groups in the region. 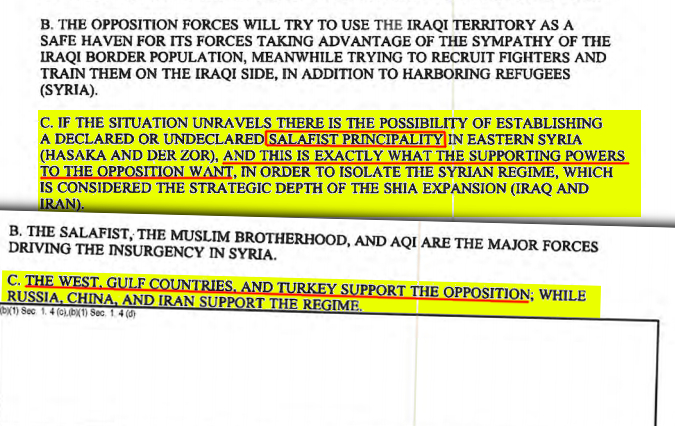 While the e-mail portrays the US in a fight against the very “Salafist” (Islamic) “principality” (State) it sought to create and use as a strategic asset in 2012, the fact that Saudi Arabia and Qatar are both acknowledged as state sponsors of the terrorist organization – and are both still enjoying immense military, economic, and political support from the United States and its European allies – indicates just how disingenuous America’s “war on terror” really is. If the US truly believed Al Qaeda carried out the deadly attacks of 9/11, why does it count among its closest allies two of Al Qaeda’s largest and most prolific state sponsors? 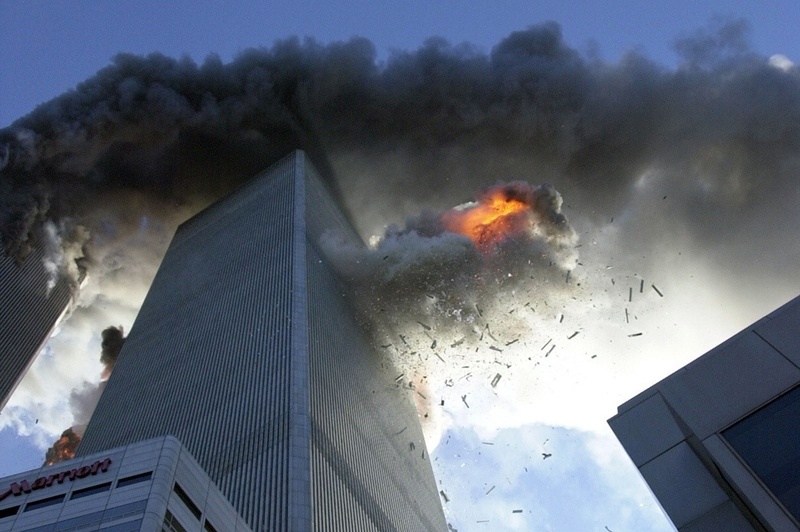 Together – by honestly answering these three questions – we are left considering the very real possibility that 9/11 was not a terrorist attack carried out by foreign terrorists, but rather an attack engineered by special interests within the United States itself. If we reject that conclusion, we must ask ourselves why the US DoD and JCS would take the time to draft plans for false flag attacks if they did not believe they were viable options US policymakers might seriously consider. At the very least we must ask why those at the DoD and JCS could be caught signing and dating a conspiracy to commit unspeakable terrorism to justify an unjust war and not only avoid criminal charges, but remain employed within the US government. We must also ask ourselves why US policymakers would draft long-term plans for reasserting American global hegemony without any conceivable pretext to justify such plans. Even in the wake of 9/11, the US government found it difficult to sell the invasion of Iraq to the American public and its allies. Without 9/11, such salesmanship would have been impossible. In Syria – with 9/11 disappearing into the distant past – US regime change efforts have all but stalled. Finally, we must find adequate explanations as to why those sponsoring the supposed perpetrators of 9/11 have remained recipients of unwavering American support, weapon sales, and both political and military protection. We must attempt to answer why militants fighting in Syria under the banner of Al Qaeda have been able to openly operate out of NATO-member Turkey’s territory for the past 6 years, side-by-side US Central Intelligence Agency (CIA) personnel who are admittedly fueling the conflict with weapons, money, and training “accidentally” ending up in Al Qaeda’s hands. It is clear – that at the very least – the official narrative in no shape, form, or way adds up. If the official narrative doesn’t add up, what does? Because I have no ambition either to be the next Chief Rabbi of Barcelona or to be subject to the whims of whoever is – as it is, I’m not even Spanish – it’s of very little direct importance to me that the current occupant of that position, one Meir Bar-Hen, is a blithering idiot. On the other hand, I am a Jew – and a human being. And on both counts it does matter very much to me that Rabbi Bar-Hen, who claims in the wake of a car-ramming attack in Barcelona (for which the motive remains unclear) that “Europe is lost” so long as its governments allow Muslims to live side by side with other citizens, is not only a fool but a bigot of unspeakable effrontery. In fact, he’s exactly the sort of man who, with Goebbels, would have pointed to Herschel Grynszpan’s murder of a young German diplomat in 1938 as “proof” that Jews could not be tolerated in Germany. And yet I confess that even the rabbi’s racism – essentially a declaration of war against every Muslim in Europe – is less infuriating to me than the silent complacency with which his remarks have been received throughout the Jewish world. One might have hoped a few Jews, even today, would remember that being stigmatized as a collective threat to civilization was a familiar Jewish experience not so long ago. In the previous century, when the Reverend A.E. Patton complained of the danger of immigrant “hordes” who were “stealthy and furtive in manner… too filthy to adopt ideals of cleanliness from the start, too bigoted to surrender any racial traditions or to absorb any true Americanism,” he was writing about Jews, not Muslims, and if asked for evidence of the threat would have pointed to nothing less momentous than the gathering storm in Russia. (The Nazis used similar “evidence,” for that matter; so did some of their descendants at the recent violent hatefest in Charlottesville.) Quite apart from its moral reprehensibility, then, is Muslim-bashing a clever game for Jews to play, given our continuing minority status and a little knowledge of our own history? And in Spain, of all places! Has a Spanish rabbi utterly forgotten what Jewish historians once dubbed the “Golden Age” of medieval Jewry – namely in Spain, under Muslim rule – and that anti-Semitic persecutions followed on the heels of the expulsion of Muslims from that country? But bigots don’t speak the language of history, just as they don’t speak the language of contemporary fact. They speak the language of power – and Rabbi Bar-Hen provides a fine example of how that language can turn the truth inside out. Just look at how neatly his recent statements, though at odds with reality, dovetail with Western imperial propaganda. Algerian Jews did face discriminatory treatment in the 1960s, in the wake of Algeria’s bloody war for independence from France (which the Jewish community, by and large, did not support). But Venezuela is a “historically open society without significant anti-Semitism,” the U.S. State Department concluded as recently as 2005. The only “grievance” of Venezuelan Jews JTA could scrape up the following year was that President Hugo Chavez had had the temerity to criticize Israeli war crimes in Lebanon. And anyway, what has Venezuela got to do with Spain? The same goes for Bar-Hen’s weird juxtaposition of Spain – where, he claims, Jews can’t survive because “radical” Muslims are “living among you” and “it’s very difficult to get rid of them” – against Israel, where he explicitly encourages his congregants to immigrate. Now, Rabbi Bar-Hen knows as well as anyone that Israel and its occupied territories have a Muslim population too (in fact, one that is proportionally larger than the Muslim community in Spain), and that this population is not altogether acquiescent. If Spain is a “hub of Islamist terror for all of Europe,” as the rabbi claims, what in the world makes Israel a safe haven? And then there’s Bar-Hen’s flagship “proof” that Spain is soft on Muslim terrorism: the fact that the government wouldn’t suppress the free travel of Leila Khaled, a Palestinian refugee who nearly 50 years ago helped hijack an airplane (hurting no one) and who wanted, to the horror of people like Rabbi Bar-Hen, to attend a book festival in Spain this year. This showed that Spanish authorities “do not understand the nature of terrorism, if they treat it as an action by the disenfranchised,” the rabbi told JTA. Got it? In Bar-Hen’s world, a Palestinian woman who was driven out of her native Haifa at the age of 4 can’t possibly be “disenfranchised.” And any country that would dream of allowing a small-time Palestinian resistance fighter to set foot in it, five decades after her last illegal act – the same country having already welcomed the likes of Shimon Peres, the butcher of Qana and eager backer of apartheid South Africa – should be ashamed of itself. That is, if its moral standard is all about what’s good for the Empire. Which, in a word, is Bar-Hen’s standard. Taken separately, each one of Bar-Hen’s remarks amounts to pure stupidity. But their sum total is something rather more sinister. Bar-Hen may be a blithering idiot, as I called him a moment ago, but what am I to call a man who scorns the mayor of Barcelona for saying, after the tragic car-ramming deaths in her city, that “Barcelona is a city of peace,” and that “[t]error will not make us stop being who we are: a brave city open to the world”? Bar-Hen thought so little of that fine statement that he said he might not attend the public solidarity rally called by the mayor, claiming security officials instructed him to avoid public areas in the coming days – because he is recognizably Jewish. Rabbi, I doubt you’ll read this column. But if you do, I’m calling your bluff. I want to know which “security officials” told you it’s not safe for a Jew with a skullcap to be seen in the streets of Barcelona, though it’s apparently quite safe for Muslims to show themselves, even immediately after a terrible crime has been blamed on someone in their community, and even with the likes of you whipping up public hysteria against them all. I want to know what entitles you to claim victimhood at the same time you incite violence against roughly a billion people worldwide. I want to know why Leila Khaled’s 50-year-old violence is reprehensible to you, while Israel’s continuing brutality is not. And I want to tell you something, Rabbi. You’re not losing “Europe.” What you’re losing is your mind – your ability to reason, to ground your opinions in fact, to guide your congregants with truth rather than propaganda. And you’re losing something else, too: your common decency. Because behind your stupidity is, as I’ve shown, a corrupt agenda every Jew, let alone a rabbi, should repudiate. Because when you sell out to imperial power, you cease to be a religious leader and become one more toady to the powers that be. Because inciting hatred against an already demonized people puts you squarely, and exclusively, in the ranks of vulgar propagandists. And this is one Jew who isn’t going to let rabbis like you forget how utterly, in a moment of crisis, you morally betrayed and abandoned us all. A US court verdict has allowed the American government to seize an office tower in New York City owned largely by an Iranian charity organization, the Alavi Foundation. A jury on Wednesday claimed that the charity was controlled by the Iranian government and the rent generated from the tower constituted a violation of US sanctions against Iran. The verdict means that federal prosecutors can move ahead with their attempt to seize the building at 650 Fifth Avenue in Manhattan. The Alavi Foundation is likely to appeal the verdict. The government plans to sell the property, which is valued at more than $500 million, and distribute much of the proceeds to victims of terrorist attacks. The finding “represents the largest civil forfeiture jury verdict and the largest terrorism-related civil forfeiture in US history,” Joon H. Kim, the acting US Attorney in Manhattan, said in a statement. The Iranian government has said it has no links with the Alavi Foundation. Prosecutors first sought to seize the tower in 2008. In 2014, US District Judge Katherine Forrest granted authority to federal prosecutors to confiscate the building. However, an appeals court reversed that ruling last year. The assets of the Alavi Foundation included the building in Manhattan, as well as Islamic centers consisting of schools and mosques in New York City, Maryland, California, Texas and Virginia. American Legal scholars said they know of only a few cases in US history in which law enforcement authorities have seized a house of worship. Without rent from the office building, the Alavi Foundation would have almost no way to continue supporting the Islamic centers. The Alavi Foundation, a non-profit organization established in 1978, works to advance the Islamic and Persian culture in the US. In the last four decades, the organization has also given millions of dollars to American schools, universities and charitable organizations; among them Harvard, Columbia and Rutgers university. Previously I argued that the phony war on “islamic terrorism”, the incessant attacks on and indictment of Islam as a violent religion, and the claim to bring so-called “democracy” to a region ruled by “dictators” are ploys for U.S. wars in the Middle East. Real motives instead, I further argued, are driving these wars with the objective to destabilize, remake, or destroy Arab societies, partition all states that are not in line with the U.S. and Israeli policies, and, in short, dismantle the Arab world. Two agendas converge to implement this effort. The first has for a focus the aims of U.S. hyper-imperialism. Besides submitting the Arab nations to U.S. plans and military control, the quest for uncontested global hegemony is the core of this agenda. While such a quest is intrinsic to the making of the colonialist nature of the American state, the part related to the Arab world is a particular detail within the overall agenda. Explanation: The Arab regions in the Middle East and North Africa enjoy unrivaled geostrategic assets palatable to U.S. imperialism. However, targeting the Arab nations for war, destruction, and partition because of resources or geographic positions makes no sense in modern times unless a wider, deeper agenda is playing out in the U.S. calculation. This raises a series of questions. What are the forces directing the Arab agenda of the United States? Are these forces responsible for the persistent hostility toward the Arabs and the active destruction of selective states? Did such a plan start with Kissinger-controlled U.S. foreign policy during the Nixon’s presidency or does it go further back in time? Were Sadat’s recognition of Israel, Israel’s invasion of Lebanon, Iraq’s American-induced invasion of Iran and Kuwait, and U.S. war on Iraq in 1991 the preparatory stages for that plan? A vital question: Do such forces persuade or coerce the United States to oppose all equitable proposals to solve the Palestinian Question? And to close, who is keeping the interventionist agenda going? Who are the proponents of the Fascist Military Pacification Model the United States wants to impose on the Arab nations? General Level: To expand the scope of Zionist narratives on Palestine, so-called right of Jews to return to it, fake historical rights, and so on. Films, TV, false archeology, fake research books, internet, propagandists, and all type of media—even cookbooks—are the avenues for such efforts. American Level: To preserve the duopoly system as is for easy management; keep the White House and Congress under tight Zionist control; keep the display of power as in AIPAC annual pageantries in order to demonstrate system’s obedience and Zionist control; conceive and implement U.S. foreign policy through American Jewish Zionists who occupy key posts in the American system. America’s European Vassals Level: To keep European states under the U.S. umbrella for a stronger Israeli control. Russian/Chinese Level: With over one million ethnic Russian Jews living in Israel, Israel has an advantage in Russia through organized Zionist lobbyists and oligarchs. The scope is to keep Russia out of the Middle East—it failed in Syria—and away from the Arabs. As for China, Israel provides American-designed military technology to increase influence thus preempting potential Chinese support for Arab causes. International Level: The U.S. belligerent posturing toward North Korea is not its own. It is Israeli by all standards and terminologies. Explanation: N. Korea provided military technology to Iran and Pakistan. That is anathema to Israel. If N. Korea were to stop cooperating with countries deemed adversaries to Israel, the U.S. saber rattling would cease instantly. The other scope is to keep flaunting any U.N. resolution critical of Israel using the U.S. hegemon as a buffer. America’s Arab vassals: The United States has practically ended, on behalf of Israel, the Arab system of nations through wars and interventions. Israel is now poised to submit all Arab regimes—not the peoples—to its military power and political will. Regional Level: To maintain Israeli superiority by means of American military supplies, as well as its own. However, the United States is now doing the major job by smashing the Arab states–one by one. The partition of Sudan and the pending partition of Iraq, Libya, Syria, and Yemen are examples. Palestinian Level: To implement the plan to settle the Palestinian Question on Israeli terms. This is how it works. Give the Palestinian a semblance of economic independence within the occupation regime; swallow what remains of historic Palestine; suffocate Gaza to death to stop the resistance; declare a “state” called “Palestine” in Gaza comprising lands taken from Egypt. Israeli Level: To intensify the Zionization, fascistization, chauvinism, and racism of the Israeli Jewish society. This is important for the continuation of the Zionist project to create a “greater Israel”. Further, the Zionist project was not about creating a “homeland” for the Jews of Europe. It is about Zionist expansions and empire. According to this scheme, turning the racist ideology of and the colonialist core of Zionism into a permanent way of thinking could guarantee the continuation of Israel as a peculiar racist state. What we want to see now is what did American Jewish Zionists do to rise to such an unprecedented power in the United States? There is a flipside to the coin. Was such a rise autonomous or dependent on factors rooted in the American system? In other words, who allowed Jewish Zionists to dominate the United States? First, U.S. presidents prior to Theodore Roosevelt might have made favorable expressions to certain Jewish individuals. However, I view such expressions as apolitical, superficial, and ceremonial. Moreover, they had no bearing into the future—this was yet to unfold depending on world events. Nor did they set the path for Franklyn D. Roosevelt and his successor Harry Truman to prepare for the installation of a Zionist entity in Palestine. It seems that the “Library” wants to convey the idea that rational political processes brought the United States to side with Zionism and later with Israel. Now, recalling that such “sympathies” might have been made in response to solicitations by Jewish personalities, they were not the political convictions of the American system. However, they became so after Woodrow Wilson publically endorsed the British Mandate for Palestine. Second, because the American system depends on ideological continuity, it is expected that Roosevelt’s anti-Arab racism and Zionist outlook would pass to his successors. Such passage would also confirm that new patterns of domestic power were emerging. Explanation: in U.S. political settings, the presidents of the imperialist state invariably adopt and further expand on the foreign policies of their predecessors. The pretense that what those presidents expressed had amounted to recognition of “Jewish claims” on Palestine is baseless. Needless to argue, the fate of Palestine, then under Ottoman rule until the end of WWI, was not a subject for U.S. presidents to decide. Colonialism, however, was the only historical force able to divide conquered nations according to self-interest or consequent to political machinations. Yet, those expressions revealed something interesting— the cultural ignorance of U.S. presidents. Fixated on biblical stories, they interchanged the religious affiliation of Europeans of Jewish faith with the ancient Hebrews. With this, a historical falsehood had been established. Later, this would become the rationalized basis to install a settler state in Palestine. When American Jewish Zionists twisted the arms of FDR and Harry Truman to make them agree to their demands, and when both presidents gave up under pressure, it became evident that a Jewish Zionist force was born. Under this premise, I view Theodore Roosevelt, Woodrow Wilson, and Franklyn D. Roosevelt as the primary facilitators of U.S. Zionism and its ascending power. Harry Truman is another story. Although, the Zionist state was born under his watch, he was not that essential in the gestation of Zionism toward power. It is true, however, that Truman, a war criminal and opportunist who sold out to Zionists to garner their vote, was a catalyst in turning American Jewish Zionists into the masters of the United States. Explanation: the installation of Israel gave momentum to the emergent power of Zionists. Still, during the transition from European Jewish invasion of Palestine to the installation of Israel, Truman did nothing but to continue with the moral cowardice and treachery of Franklyn D. Roosevelt toward the Arabs. To back the views I just presented, I will discuss in this part Theodore Roosevelt and Woodrow Wilson; in the upcoming Part 5, I will discuss Franklyn D. Roosevelt. Ever since New York Jewish Zionists supported his campaign for governor of New York, and later for president, Roosevelt, a racist and an avowed colonialist in the American tradition, set the stage for a long-lasting confrontational U.S. policy toward the Arabs. With that policy came the gradual elevation of American Jewish Zionists to the claimed status of “king makers” of American politics—especially in the making of foreign policy. Here I want to stress one aspect, which is how the hate of the Arabs became synonymous with the Jewish Zionist power. It works like this: If an American individual wants to run for office, he must declare or pledge in advance his support of Israel against all its “enemies”—the Arabs. On the other hand, opposing Israel (or Zionism) on any ground could mean losing elections and careers. How did Theodore Roosevelt set the stage for a durable anti-Arab policy of the United States? Roosevelt’s opinion on regions dominated by Mohammedanism—his word for Islam—was in tune with his bigoted ideology. Anyone, of course, is entitled to his opinion. But when an American president expresses racist remarks debasing peoples and their religion, the implication is enormous. Simply, it means that said president, his administration, and subsequent administrations would most likely take the same path. This is how political states stay in business. Eventually, a nurtured prejudice could evolve into state policy— the systematic destruction of the Original Peoples of the United States and the ideology of the Third Reich are examples. Consequently, it is not farfetched to say that Roosevelt’s prejudice had come a long way. Today, it has become the official philosophy of the United States. Comment: I could write a full dissertation on Kennedy’s speech and the excerpt I just cited . . . What Kennedy said is a classic example of political succumbence. It also shows how indoctrinations, political posturing, and the expected benefits from sycophancy seep from a political epoch to another. For instance, in his lengthy speech, he never uttered the words Palestine or Palestinians. And when he talked about the Palestinians kicked out of their lands by Jewish Zionist terrorists, he called them “Arab refugees”. (See pictures of Palestinians kicked out by Zionists in 1948). Beyond that, it confirms that the imperialist state had blindly embraced the Zionist narratives. And to close, it demonstrates a culture of obedience to Zionism, and acute prejudice against the Arabs. Above all, Kennedy’s speech highlighted the ascending power of American Jewish Zionism in the United States. Let us go back to Roosevelt. When he made his racist feelings known, he appeared to have implied that only when Christianity is supreme, intellectual and well-being are guaranteed. In saying so, he gave Jewish Zionists the ideological weapons to fight Arab and Palestinian nationalisms. To be noted, Roosevelt’ praise for Lord Cromer is revealing. In casting his praise with words such as, “the greatest modern colonial administrators”, he left no doubt that the guiding light of the United States is an ideology that glorifies colonialism and slavery while turning colonialist administrators into symbols of virtue and rectitude. The question one may ask, what were Roosevelt’s rationales and historic justification for a Zionist state “around Jerusalem”? Why is it “entirely proper to start a Zionist state”? What makes it proper: his ideology or bigotry? Why did he ignore the Palestinians who lived in, around, and beyond Jerusalem? From studying how U.S. presidents interacted with Zionism and Israel, we may be able to draw some conclusions. For instance, from Theodore Roosevelt to Herbert Hoover, the trend was to mix theology, mythology, and colonialism. From FDR to George H. W. Bush the tunes changed to include the primacy of imperialism and the usefulness of Israel to America’s global agenda. From Bill Clinton to Donald Trump, theology and mythology resurfaced but this time the fuel is anti-Muslim Christian Zionism, anti-Arab Neocon Jewish Zionism, and the new plans to partition the Arab states. It is known that the beginning of any process is a tone-setter for the next enterprise. Under this light, Wilson’s way of thinking about a Zionist state acquires special importance. It rested on four grounds: theological dogmas, Manifest Destiney beliefs, colonialist mindset, and on his conviction of the virtues of European colonialist states. When he (under suspicious circumstances  ), selected the Jewish Zionist Louis Dembitz Brandeis to be his informal advisor on foreign policy, he set the precedent for the rise of many Jewish Zionist advisors and chiefs of staff to presidents and vice presidents. But when he appointed him to the Supreme Court, he initiated the process of the Zionist penetration into the American state. Well, now that we know how Wilson had gotten his political education on the claims of Zionism, let us move forward. Brandeis is a master manipulator. Klinger’s statement that Brandeis convinced Wilson that “supporting the British plan for Palestine means that American foreign policy was not shaped and directed by the British but by American interests” was a winning tactic. It gave self‑importance to a United States. I view that tactic as an early indication of how American Jewish Zionists intended to manipulate the United States. Did Wilson comply with the coaching imparted to him by Brandeis? Despite academic credentials and a university post, Wilson manifested clear intellectual confusion. First, he mingled between diverse categories of thought. Second, his mix-up was so severe that he bundled theology (divinity, etc.) with mythology as in his “various passages in the Bible”. And, if that were not sufficient, he added to the mixture a dose of political gibberish as in the dictions “pure democracy”, “monarchy”, etc. Then he resorted to colonialism as in his phrase “to help restore … etc. Not only that, but his approach to important U.S. policy directions that structurally overlooked the existence of the Palestinians—the future victims of his planned “restoration” smacks of ignorance, dishonesty, callousness, and ethical perfidy. I wonder how Wilson would have responded to a question such as this: Mr. President, did you ever think to restore the Original Peoples of the United States to the lands you and your predecessors have stolen by fire, forced relocations, and extermination? Next, I will discuss Franklyn D. Roosevelt and other issues. Alleged Wilson’s adultery was seized to blackmail him. I’m no fan of hoaxes and allegations. However, unbiased research is needed to ascertain validity. The following link provides some background on this issue: The Making of Woodrow Wilson— An American Nero? Examples include Henry Kissinger, Samuel Berger, Irving Lewis Libby, David Axelrod, Rahm Emanuel, etc. *(Trump speaking at AIPAC. Image credit: Lorie Shaull/ flickr).